I just checked my Google Scholar profile today, and noticed something semi-momentous: “Orangutan Cultures and the Evolution of Material Culture” has been cited by 1,001 other publications. This is the primary publication based on work from my dissertation on orangutan cultures, published in one of the world’s most prestigious journals, Science. 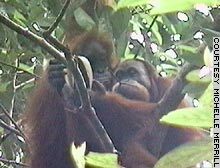 The Science paper includes comparisons of six sites where orangutans had been studied extensively (I included three others in Chapter 2 of my dissertation). As I’ve said before and I’ll say again, all orangutans are critically endangered. My recent work on higher education for sustainability is my effort to address some of the larger systemic problems that have put so many species and habitats in peril. What human beings are doing to our beautiful world the way are, will only lead to our eventual demise.